The girls came over for dinner on Saturday night. Well, I say dinner but it was a glorified picnic that consisted of tartiflette nests and salad. 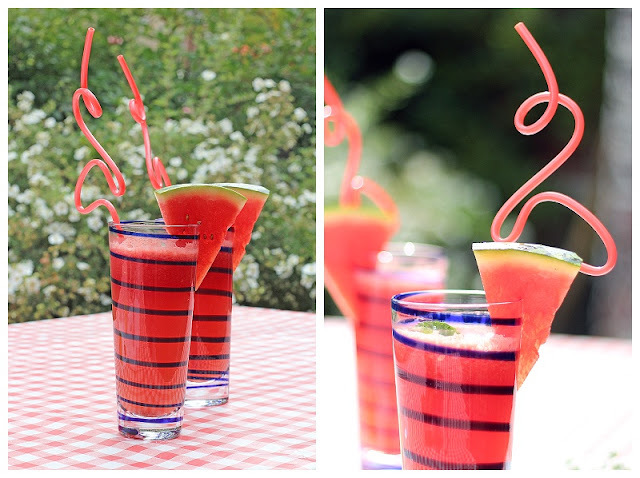 To make it feel a little more special I decided to put the watermelon sitting in my fridge to good use and bust out a watermelon lemonade - it seemed the perfect thing for a sunny Saturday evening in the garden and a great excuse to get my flamingo straws out! Half a watermelon - mine was about 400g of fruit when halved and cut up. 1ltr of ice cold water. The juice of 6 lemons. Ice and watermelon slices to serve. Juice your lemons and pop in the blender. 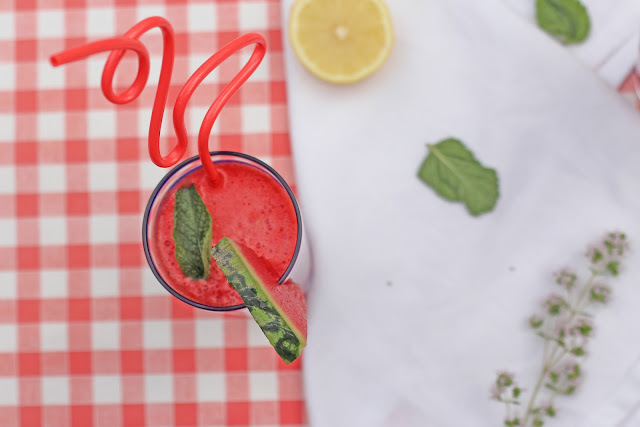 Throw the watermelon in with it and blend until it's all blitzed. I've got a Kitchen Aid blender and used the cocktail shaker setting! If you had a seeded watermelon (like I did) it might be worth sieving it to get rid of them. In a large jug mix together the cold water and the sugar (I used 75g as I like the tang of the lemons, but you could use more to make it sweeter!). Mix in the lemon and watermelon juice. Add a handful of mint leaves and stir them in. 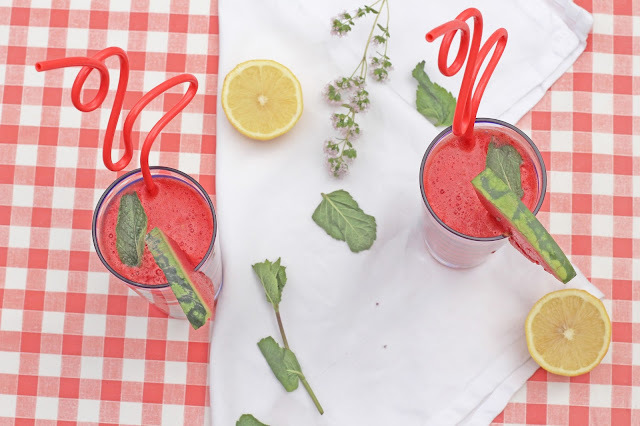 Find some cute glasses, fun straws (mine are from Sainsbury's - if you hurry you might be able to get some from their sale!) 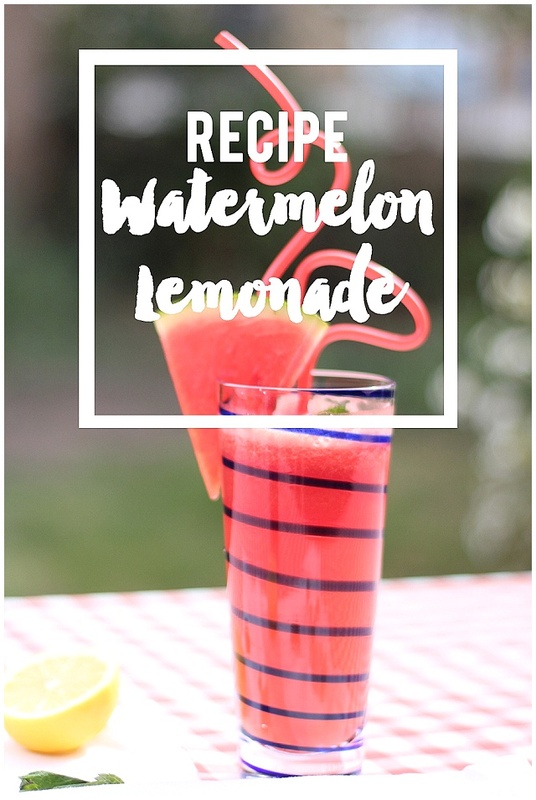 and add ice and a slice of watermelon just as you're about to serve. One of the ladies that came over is prego so I went for a virgin version straight out of the mixer, but the rest of us might have been a little cheeky and added a glug or two of vodka to the mix - I am sure rum would work too! What's your favourite summer tipple? P.s I've been nominated in the Amara Awards DIY and Craft category - which is a huge honour. 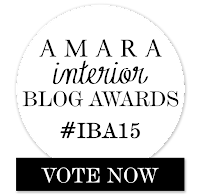 To vote for me you can pop over to their site http://www.interiorblogawards.com/vote/oh-gosh/ or click the image!